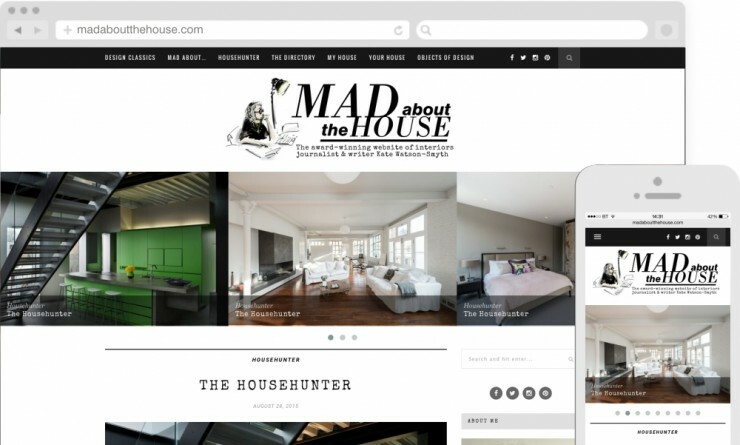 Firmly established as the go-to blog for design inspiration, Mad about the House fancied redecorating so called in 286blue to work on the logo, branding, and website. 286blue incorporated an editorial look to reflect the extensive newspaper and magazine background of Kate Watson-Smyth, the interiors journalist and writer behind the site, and created a logo that’s elegant yet strong, stylish and authoritative – the blog is rated the Number 1 Interiors Blog in the UK after all. With the web-hosting already in place since the site was launched in 2012, 286blue was able to apply the stylish new look quickly. The site design and logo is clean and stylish in classic black & white using a journo typewriter font, coupled with an illustration by Paul Kercal, to add a magazine masthead feel.